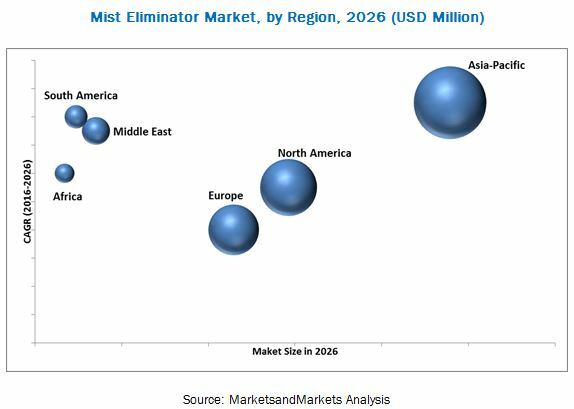 [133 Pages Report] The global mist eliminator market is projected to reach USD 1,152.4 Million by 2026, at a CAGR of 5.3% from 2016 to 2026. The market is expected to witness moderate growth in the coming years, due to the increasing number of coal-fired power plants around the world coupled with attractive social policies and incentives measures taken by countries to promote the use of mist elimination methods in industrial applications. To forecast the market size in terms of value with respect to the main regions (along with countries), namely, Asia-Pacific, North America, Europe, Middle East, South America, and Africa. The research methodology used to estimate and forecast the global mist eliminator market begins with capturing data on key vendor revenues through secondary research such as the Power Magazine, Power Plant Chemistry, ELP, IBEF, and the EPRI journal. Secondary research was mainly conducted to obtain key information about the industry’s supply chain, the market’s monetary chain, the total pool of players, and market classification & segmentation according to industry trends to the bottom-most level, regional markets, and key developments from both market and technology-oriented perspectives. The primary sources are mainly experts from core and related industries and preferred suppliers, manufacturers, distributors, service providers, technology developers, alliances, and organizations related to all segments of this industry’s value chain. In-depth interviews of various primary respondents that include key industry participants, subject matter experts (SMEs), C-level executives of key market players, and industry consultants were conducted to obtain and verify critical qualitative and quantitative information as well as to assess future prospects of the market. The vendor offerings are also taken into consideration to determine the market segmentation. After arriving at the overall market size, the total market was split into several segments and subsegments, which were later verified through primary research by conducting extensive interviews with key personnel, such as CEOs, VPs, directors, and executives. Data triangulation and market breakdown procedures were employed to complete the overall market engineering process and arrive at the exact statistics for all segments and subsegments of the market. The breakdown of profiles of primaries is depicted in the figure below. The global mist eliminator market has a diversified ecosystem of upstream players, including raw material suppliers, along with downstream stakeholders, vendors, end-users, and government organizations. Companies operating in the global mist eliminator market include Sulzer Chemtech (Winterthur, Switzerland), FMC Technologies Inc. (Texas, U.S.), Munter AB (Stockholm, Sweden), Koch-Glitsch (Kansas, U.S.), Sullair LLC (New York, U.S.), Kimre Inc. (Miami, Florida), Air Quality Engineering, Inc. (Minneapolis, U.S.), MECS Inc. (Missouri, U.S.), AMACS (Texas, U.S.), and Hillard Corporation (New York, U.S.) among others. “This study answers several questions for the stakeholders, primarily which market segments they should focus upon during the next two to five years so that they may prioritize their efforts and investments accordingly”. Scope of the Report: This research report categorizes the global mist eliminator market on the basis of type, material, end-user, application and region, forecasting revenues as well as analyzing trends in each of the sub-markets. Further breakdown of Rest of the APAC and Rest of Europe mist eliminator market. The global mist eliminator market is projected to reach USD 1,152.4 Million by 2026, at a CAGR of 5.3% between 2016 and 2026. This growth of this market can be attributed to the growth of the desalination industry in the developed economies including the U.S. and the European countries coupled with increasing expenditure on coal-fired power generation and petrochemical industries in emerging economies including China, India, Brazil, South Africa, and the UAE. The oil & gas segment dominated the global mist eliminator market in 2015, followed by the desalination segment. The desalination segment is projected to grow at the highest CAGR from 2016 to 2026, due to increasing scarcity of water for industrial applications in the U.S., the Middle East, and others. Wire mesh was the largest type segment of the mist eliminator market in 2015. It is the most common type of mist eliminator, and is used in a wide range of industrial applications. Between 2016 and 2026, wire mesh is projected to be the fastest-growing type segment. This growth can be attributed to wire mesh’s low cost and efficient removal of entrained liquid droplets from vapour or gas streams. Asia-Pacific is the fastest-growing market, as it is a major consumer of the mist eliminators. There is an increasing demand for the mist eliminators from both, developed and emerging countries such as Japan, China, India, Australia, and others. An increasing number of coal-based thermal power plants is expected to drive the growth of the mist eliminators market in China and India. A growing population, urbanization, and investments in end-use industries are driving the growth of the mist eliminator market in the Asia-Pacific region. Increasing chemical manufacturing, increased cement production, coupled with the growing iron & steel industry, is expected to further boost the mist eliminator market in this region. One of the major factors inhibiting the growth of the market is the emerging alternative renewable sources of energy as a number of power generation sources of energy, such as nuclear, hydro, wind, and solar, have no emissions. 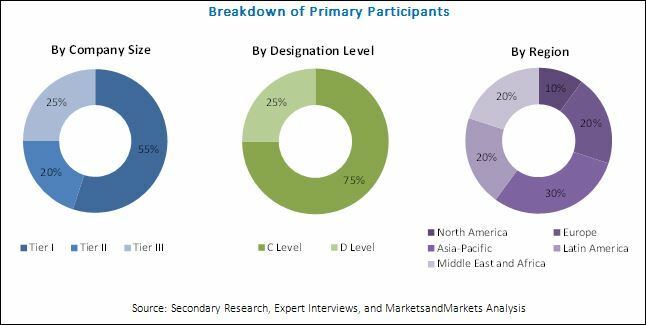 Key market players operating in the global mist eliminator market are Sulzer Chemtech (Winterthur, Switzerland), FMC Technologies Inc. (Texas, U.S.), Munter AB (Stockholm, Sweden), Koch-Glitsch (Kansas, U.S.), Sullair LLC (New York, U.S.), Kimre Inc. (Miami, Florida), Air Quality Engineering, Inc. (Minneapolis, U.S.), MECS Inc. (Missouri, U.S.), AMACS (Texas, U.S.), and Hillard Corporation (New York, U.S.) among others. 13.8 Air Quality Engineering, Inc.